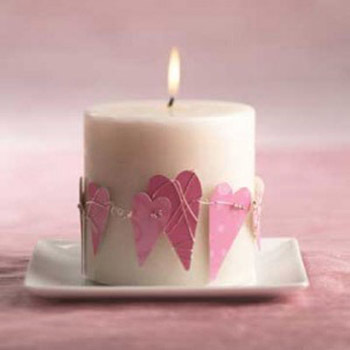 Pink hearts decorations can transform an ordinary candles into beautiful table centerpieces, delighting your partner and bringing romantic mood into your home. Hearts decorations are traditional Valentines Day ideas for crafts, room, food and table decorations that communicate love and appreciation. Red, purple and pink hears are easy to make of craft paper. Combined with shiny buttons, ribbons or beads, they turn candles into unique handmade table decorations for your romantic dinner on Valentine’s Day. Handmade hearts decorations for candles can vary in sizes and colors also, creating monochromatic or colorful Valentines Day table centerpieces. 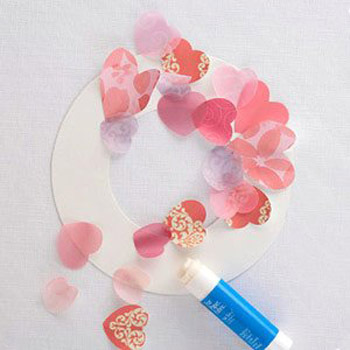 You can write love words on paper hearts, creating warm and personal Valentines Day decorations. 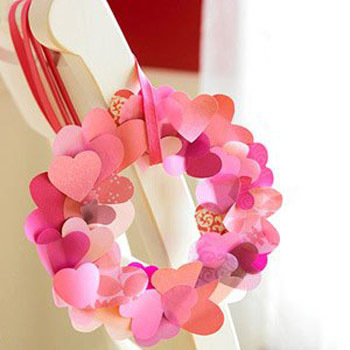 Handmade hearts decorations are excellent for simple Valentines Day wreaths. Made of pink napkins or craft paper hearts for garlands and wreaths are excellent for dining chair decorations. Small and large, red, purple and pink hearts create special atmosphere for the romantic lunch or dinner. Colorful craft paper, scissors, beards, ribbons, glue and your creativity are all you nedd for surprising your loved ones. Simple and elegant, inexpensive and attractive, handmade Valentines decorations and gifts are wonderful craft ideas for kids and adults, and a nice way to make your loved ones feel very special on Valentines Day and after it.